The miracle berry might be bland in taste, but it does magnificent things to your taste receptors! Photo courtesy of miraclefruitberries.info. First, forget about the “taste regions” on your tongue. There isn’t one place that is better at tasting sweet than any other place on your tongue. Your entire tongue (and parts of your throat and palette) is covered in taste receptors, which receive one of four signals: salty, sweet, bitter, or sour. Sour receptors are stimulated by acids such as citric acid (in citrus), acetic acid (in vinegar), and carbonic acid (in soft drinks). Miracle berries come in pill form too! This is just a small assortment of foods that taste amazing with a miracle berry. Photo courtesy of cookingforshelley.blogspot.com. 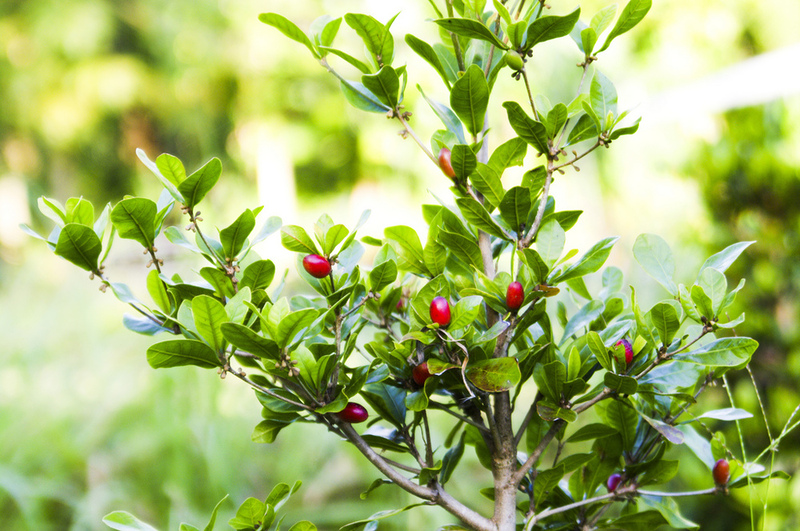 When you eat a miracle berry, it’s thought that the protein miraculin (aptly named) binds to your sour receptors. This binding modifies the receptors, making you perceive acidic (sour) foods as sweet. Lemons and limes suddenly taste like candy, vinegar like apple juice, and wine tastes like a glass of Manischewitz. I’d also suggest tasting radishes, hot sauce, dark beers, goat cheese, mustard, strawberries, tequila, and pickles if you can ever get under the influence of one of these fruits. Miraculin gives no lasting effect, giving the consumer an hour or two of modified tasting and no side-effects of eating the berry have been found. The only real major health risk is if a person consumes too much acidic food in one sitting. Miraculin changes the perceived taste, not the chemistry of the food. This leaves the mouth, throat, and stomach vulnerable to the high acidity of some foods, which may cause irritation and nausea in high quantities. For example, a friend of mine told me about a man who drank a whole bottle of vinegar in one sitting after eating a miracle berry. While delicious going down, the stomach didn’t appreciate all the acid and he promptly threw the vinegar up and was out of commission for three days. Photo courtesy of the user "dubofadubofadub" on flickr.com. Due to its special properties, miraculin was proposed as a sweetener in acidic foods such as soft drinks. Researchers were able to genetically modify bacteria, lettuce, and tomatoes to produce miraculin in large amounts, but when it was brought to the United States Food and Drug Administration (FDA) it wasn’t approved as being a “generally recognized as safe” food. It was decided that it would be categorized as a “food additive” and would therefore require years of further testing. Investors of commercially produced miraculin eventually dropped the product and it was never developed. There have also been accusations that the project was sabotaged by the sugar industry, putting pressure on the FDA. When the documentation regarding how the FDA came to their decision was made public, it was nearly all blacked out and the rationale for the sudden change was never revealed to the public. Weird, right? Some good news: miraculin has been approved for commercial use in Japan. If you want to try out miracle berries for yourself, you can buy the berries online. Berries cost about $90 for 30, but buying a mature miracle berry plant may pay off in the long run; one plant is capable of producing hundreds of berries in one flowering. I highly recommend trying this taste experiment, but be prepared to have your mind blown. From the BBC Horizon documentary The Truth About Taste, Homaro Cantu explains the unusual dining experience at his Chicago restaurant. If you like what you read here, don’t forget to check out some of the other really interesting posts here on feedthedatamonster.com! Stay hungry!